If you are one of the 6.5 billion people who missed my Introduction to Vault Programming webcast, you can catch up by downloading it from our webcast archive. UPDATE: The second webcast, Intermediate Vault Programming, is now posted on the webcast archive. NOTE: I can't get the two live demos to view properly. My guess is that there is a problem with the recording. I plan on re-recording those demos and posting them sometime next month. Update: This article has been re-written for Vault 2012. In my opinion, the new article does a better job of explaining the major concepts. In the Vault 2011 API, many of the features are driven by an Entity concept. In fact, entire services use Entities as their common currency. Specifically the Behavior, Category, Property, Replication, Revision and Security services. So what are Entities? How do you use them? Quick Definition: An Entity allows a feature to be applied to multiple object types. The closest analogy I can come up with is the Object base class in .NET. It's kind of like a top-level base class which can be used to manipulated objects in an abstract way. For Vault, this means that there can be a single function that operates on multiple object types. In earlier versions of Vault, separate functions had to be created for each item type. Most of the major objects are Entities, such as Files and Folders. But some things are not, like Users and Groups. I don't want to go into why some things are Entities and some things are not. That explanation would require me to go deep into the database architecture. The general rule is to assume that everything is not an Entity unless explicitly stated. A File object actually has 2 Entities contained inside it. The "File Version" Entity and the "File Master" Entity. These are uniquely identified by the Id and MasterId properties respectively. The function parameter will usually tell you which ID to pass in. For Item objects, there are 3 Entities: Item Version, Item Revision and Item Master. Internal to the database, there are more Entity types, but they can't be used as Entities at the API level. Just because a function takes an EntityId doesn't mean the function will work with all Entity types. For example, if you pass in a Folder.Id to GetProperites, it will fail because Vault does not support properties on Folders. So there is some burden on the programmer to know which functions work on which Entity types. Knowledge of the Vault product itself should be sufficient to deduce this information. All Entity ID values are taken from the same numbering system. For example, if you have a Folder with an ID of 5, there will be no Files with an ID of 5 for the Vault. EntityMasterId - This is the ID value that matches to the master concept, which refers to all versions of the object (ex. File.MasterId). If the object isn't a type that is versioned, just pass in the regular 'Id' property (ex. Folder.Id). EntityClassId - This is a string value that tells what type of object to work with. Some functions require this information and some do not. Call AdminService.GetServerConfiguration() to see the list of legal values. NOTE: Folder is noticeably absent from the list. The reason is that there are are no functions that require an EntityClassId of "FOLDER". Welcome back to my Storing Custom Data series, where I go into the various ways you can store custom data needed by your Vault customization. Last time I talked about using the Vault Options concept to store your data. In this article, I'll be focusing on the Job Processor API, which allows you to hook to the Jobserver feature. If you are writing a custom job handler, you might want it to remember some settings. Although Vault Options can be used, I want to explore something that doesn't involve additional Vault API calls. It's possible to have the job handler store all the data itself, with a local settings file for example. The theory is that the job handler "owns" the data. Any edits to the data, must go through the custom job handler. From the client's point of view, the data maintenance tasks are a black box. Any outside changes to this data would have do be done through a custom job. Watch Folder has an example of this technique. Most of the work in that utility is done by a custom job handler. That handler also keeps track of which users are watching which folders. When a user says that they want to watch a folder, it causes a job to be queued. The job informs the handler of the update to the watch settings. The handler reads this job and updates the settings accordingly. In this case, the settings are in an XML file local to the handler. When a job comes in telling the handler to scan for new files and send out emails, it does a re-read the settings file. HandlerClass.cs in the WatchFolderJobHandler project has the sample code. WatchCollection.xml is the file that remembers the folders being watched for each user. "Autodesk.WatchFolder.SettingJob" is the job type that tells the hander to update the settings. "Autodesk.WatchFolder.NotificationJob" is the job type that tells the handler to scan for new files and send out the emails. This technique is probably more trouble than it's worth, but it's still worth looking into. It's up to you to decide if this technique is best for your requirements. No easy way for a client to see the settings. Because the job handler owns the settings, the only way to see them is talk to the job handler. And the only way to talk to a job handler is to queue up a job. Once the handler gets the job, some sort of mechanism needs to be developed for the job handler to pass the data back to the client (for example, an email). Best case scenario is a few minute delay between the request and the results. Multiple handlers may be on the network at a given time. This can result in a fragmented data set. One way to solve this would be to put the settings in a file on a network share. The handlers would need to handle things gracefully if they both try to write to the file at the same time. Another option is to require only one handler on the network at a time. But there is no framework in place to enforce this configuration. Connected workgroups add problems too. Each workgroup has its own queue, which does not get replicated to the other workgroups. So again, it's possible to have fragmented data. This might be OK as long as users stick to a single workgroup. Another workaround is for the user to log-in to the workgroup with the job handler running to do the one or two things needed for that operation. Then they can log-out and go back to their local workgroup. From a permissions standpoint, the user needs to be at least Document Editor (Level 1) to be able to add jobs to the queue. If you have looked at the code for the SDK or blog samples, you probably noticed a class called ServiceManager, which acts as a factory for creating service objects. It's very useful for things like setting the URL and security information each time a service object is created. The only problem is that no two ServiceManagers are the same. I would end up coping it from project to project. Then I would modify it for that specific app. For example, some apps would have GetItemService while other would now. Some Service managers allowed multiple logins while others assumed a single login. So, I decided to create a single ServiceManager that could be used with any app without the need for modification. I put in in a separate DLL called JustOnesAndZeros.WebServices.dll and added it to my Effective Folder Permissions 2.0 and Watch Folder samples. A single function, GetService() works for all web services classes in the Vault API. Manages the security context for all services it creates. Recognizes VaultContext objects from the Vault Client or Job Processor APIs. Can handle multiple simultaneous logins. Note: I titled the DLL after my blog, not after my company. I deliberately avoided using the word "Autodesk" to make it clear that this is my own set of utilities and the contents of the DLL are not part of the official Vault SDK. Feel free to use ServiceManager or any other items from JustOnesAndZeros.WebServices.dll. But I recommend copying the code into your project instead of linking to the DLL. I will be constantly updating the DLL as new samples come out. So it's not a very stable thing to link to. I'm not the only one posting Vault applications. Madhan, one of our QA engineers, posted a utility that copies the Vault folder structure to your local disk. 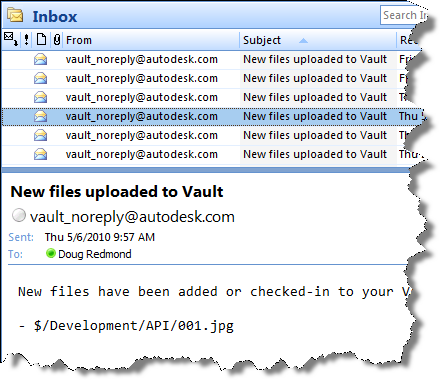 Wouldn't it be nice if Vault could email you when a file was added or changed? Wouldn't it be even nicer if somebody were to program that feature and post it on his blog? If the answer is yes and yes, then go out and buy a lottery ticket because today is your lucky day. 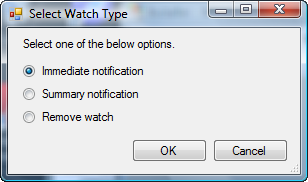 Watch Folder is a program that lets you set "watches" on Vault folders that you want to monitor. Whenever a file is added or checked-in to one of your watch folders, you get an email. You have the option of getting immediate emails or periodic summary emails. NOTE: This isn't something you can just download and run. The Vault administrator needs to set up some server components before this feature can be used. For Vault users, download the application and run the installer. Just make sure that the administrator has set up the proper server components first. For Vault administrators, download the server components and follow the instructions in the readme file. A watch on a folder will automatically apply to any sub-folders. Removing a watch will also remove watches on sub-folders. You can't have an immediate watch and a summary watch on the same folder. Setting a folder to one type overwrites the existing setting. 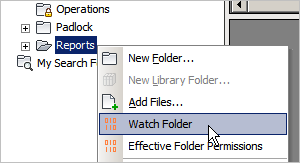 You need to be at least Document Editor (level 1) in order to set up a watch on a folder. You need to have a valid email address in your Vault user settings. The contents of the email can be customized by the Vault administrator. See readme file. This month there are 2 free webcasts on Vault API programming. Both sessions will be about 90 minutes long with plenty of time for questions at the end. This session goes over the fundamental concepts in all 3 Vault 2011 APIs. This session goes deeper into Vault 2011 programming. More concepts are covered, and there will be a focus on common Vault API workflows. Special thanks to the good folks at the Autodesk Developer Network for hosting these webcasts.